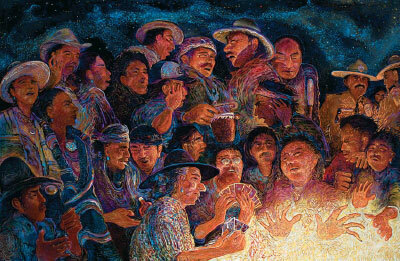 There is no escaping the light in Shonto Begay's paintings. Whether it is the blazing sun at midday, a fire lighting faces in the dark, or the pale glow of a smartphone, light illuminates in many ways. 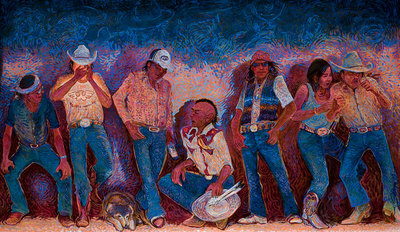 Shonto Begay, Saturday Night Taunt Three, Acrylic on Canvas, 48" x 76"
Begay arises each morning "to pay homage to the first light. We say prayers and place offerings and ask for help to be resolute during the day. We ask to be able to see the blessings of life and not to take them for granted." First light gives way to the bright light of the day. "The land embraces the light and the color lingers long after darkness settles. The quest "for the life-giving quality of light gives power to your vision," says Begay. "Light is light, it illuminates and makes us see things. But it is different in different places. You don't get the same sense of light living in a city, or in the mountains, or in the forest." 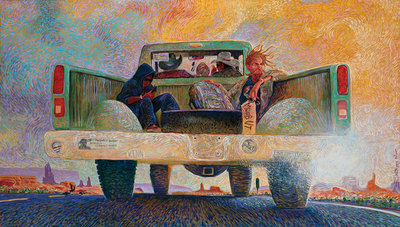 Shonto Begay, Moab Bound, Acrylic on Canvas, 48" x 72"
Even Begay's name, given to him by his great-great-grandmother, refers to light. He explains, "It means the glittery surface upon the water that reflects its light back upon the wall of the canyon, dancing and shimmering." 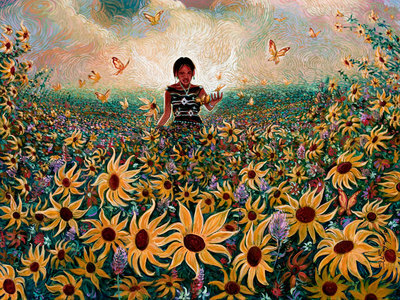 Shonto Begay, Promises Blooming, Acrylic on Canvas, 30" x 40"
Shimmering light animates all his work. But light is also accompanied by sound. 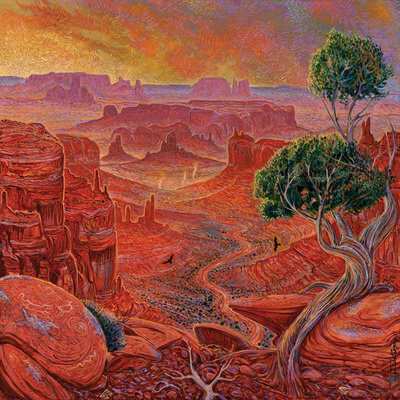 Monument Symphony is a 4-foot square acrylic painting of Monument Valley Navajo Tribal Park from Mitchell Mesa. Begay speaks of "listening to the landscape. Three dust devils meander across the valley. Two ravens soar between the mesa and vallery floor. The sound of the wind and call of the ravens makes a rhythmic symphony. In the foreground there are ancient pictographs. Someone has listened before." He explains "the way I paint is like a visual chant. The broken lines, dots, and strokes make a rhythm so the painting is like thousands of syllables." The startling monumentality of an old pickup driving into the valley commands the frame of the 4-by-7-foot Moab Bound. The innate sense of family among the Navajo extends to a hitchhiker. "We travel the road, and we read people." Begay observes. "These guys didn't want the dude to end up roasted on the side of the road." A group of ravens is already feasting on roadkill to the left. "While a good conversation goes on in the cab, the hitchhiker checks out the light in the colorful landscape, the boy checks out a different light, connecting in a different way. It's probably too windy for the guys to talk. Or maybe they're shy." He notes that the massive truck against the landscape will soon diminish into the massive landscape itself. 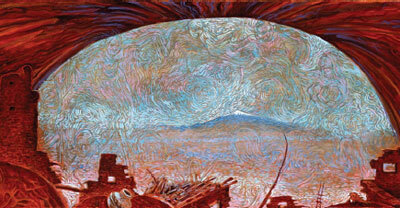 Shonto Begay, Second Night Glow, Acrylic on Canvas, 52" x 82"
"We live in the part of the land where the skin of Mother Earth is thin so we tread lightly with prayer on our lips. The thinness of the epidermis brings us closer to meet the soul of the mother. That's why I'm drawn back to it." "The land is quiet and sacred," he says, "but its stories are always audible. Anyone can pass into it - into a kinship with it. With patient eyes and quiet mouth we see more from that communication." Shonto Begay, Monument Symphony, Acrylic on Canvas, 48" x 48"